Expect approximately 20 – 30 minutes install time. You want to be absolutely safe. Purpose: This document is going to show you where we lift our Camaro while performing modifications. Please consult your manual and mechanic to be sure you lift your car in a safe manner. This document is for education purposes only and I nor anyone else is responsible for the attempts you make to lift your car. 1. We lift our car by the front first. Therefore, place wheel chocks on both sides of each tire on the rear of the car (see Figure 1 below). 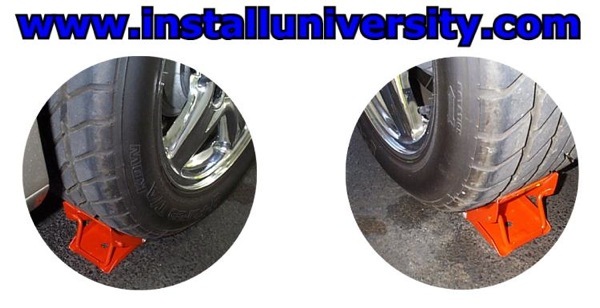 The two pictures are of the same tire. One picture shows the front of the rear tire and the other the rear of the tire. The same should be done for the corresponding tire on the other side of the rear of the car. 2. Lifting by the center of the front "K" member will get the front end off the ground. We drive the car up on ramps and then lift. It is a tight fit otherwise. A small piece of lumber will work instead of ramps. That will give you the clearance you need. Notice how our ramps are turned around backwards. This allows room for the jack stands and adds an extra step of safety. 3. We slide the front jack stands under the front sub-frame rail as shown in Figure 3. The yellow bar is the passenger side BMR sub-frame connector (sfc). The flat plate at the front of the sfc covers the best place to put the paw of the jack stands. Cars without these sfc's should place the jack stands directly underneath the area covered by the flat plate. I didn't want to mess up the powder coating so I place them at the front. This is perfectly alright as well. 4. Next will be to remove the floor jack from the front of the car. Make sure the four corners of the floor jack all touch the ground. 5. 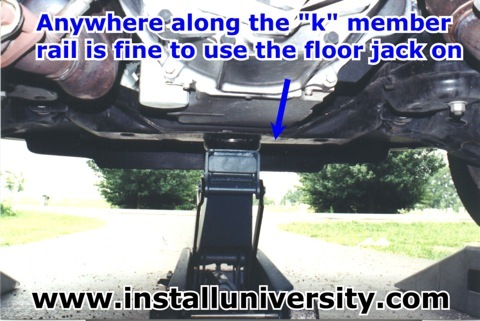 Slide the floor jack underneath the rear of your car. This will be a tight fit on lowered cars. I suggest have the rear tires rest on top of a small piece of lumber. A two foot section of a 2x10 should work great. Otherwise, you might scrap the bottom of your muffler. You want to lift on the rear differential housing and not the cover as shown in Figure 4. It is imperative that you check and double check this step. If you jack up on the cover, you will be doing a fluid change and purchasing a new cover for your car. 6. Next you want to slide the jack stands underneath the rear sub-frame rails (see Figure 5). There is an outer and inner rail on the car. 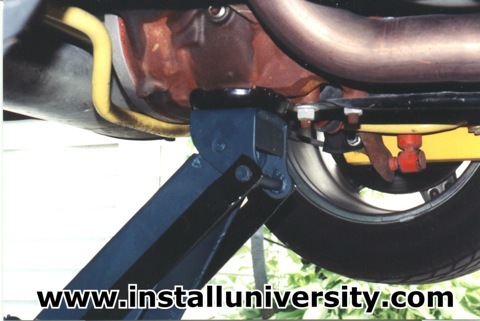 We prefer to place the jack stand paws on the outer rail just in front of the lower control arm (lca). However, notice that the sfc's are in the way. BMR's sfc's can be lifted on without any problems, we just want to keep the powder coating looking its best so we place the jack stand paws on the inner rail. 7. 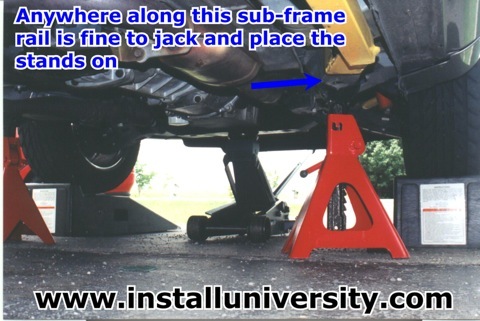 When letting the floor jack down so the car will sit on the jack stands, be sure to notice if the jack stand legs sit properly on the ground. Also notice if the legs on the front jack stands sit properly as well. I always give the car a good twice over before getting under it. I also place small pieces of a steel I-Beam under the rear tires while having the ramps under the front tires. Safety should not be compromised, it is your life you are gambling with! Comments: Take your time and be careful!! Also, be sure that performance shops or dealerships lift your LS1 correctly. Otherwise, you will end up with two bent or busted front fenders that a lot of F-Body owners experience, including us! Web Author: Eric Barger help@installuniversity.com Copyright © 1999, 2000 Eric Barger. All rights reserved. Revised: June 07, 2007.